I have been studying and performing as a drummer and percussionist for many years and enjoy sharing my passion with others. I have many music industry experiences in a variety of styles, from which I draw upon in my teaching. 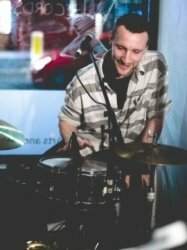 In terms of popular music, these range from performing in Warner Brothers showcases; recording sessions in Metropolis, Hackney Road and Goldsmiths Music Studios; and professional function band performances at weddings and corporate events. I received a Master’s degree in Music at Goldsmiths College, University of London, in 2018 with a particular interest in performance practices. In 2017 I spent over seven months in Santiago de Cuba learning intensively with the great Afro-Cuban percussionists Ramon Marquez and Manolo El Duque. I am creative in my tutoring approach, my lessons are engaging and inventive. My various musical experiences as a student and performer give me a broad understanding of learning, which informs my own teaching and helps me better communicate and relate with my students.